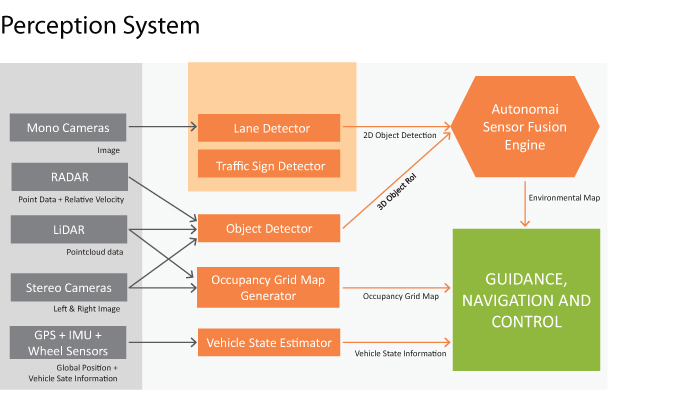 Tata Elxsi’s advanced autonomous vehicle middleware platform ‘Autonomai’, with deep learning and AI capabilities, is designed to help OEMs and system suppliers build, test and deploy customizable autonomous vehicle applications. The perception system uses multi-sensor information to perceive the environment (i.e. detect, identify & classify the objects) around the vehicle. Specific routines or algorithms that detect traffic signs, road edges, lanes, type of objects like vehicles & pedestrians are part of the perception system. Ego vehicle’s state is used for refining the detections. This set of functions deliver the information on the objects – ID, classifications, size, locations, instructions/ signs etc. 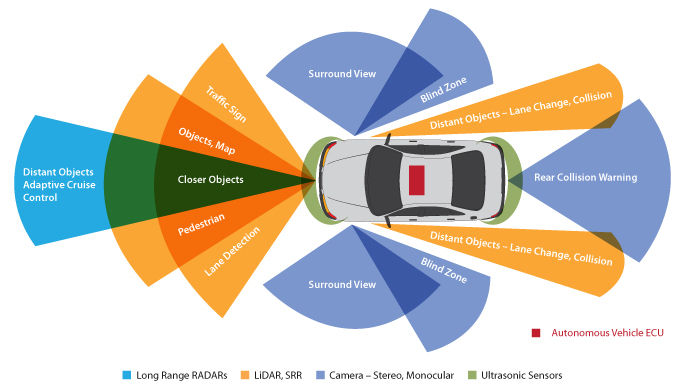 The Guidance, Navigation and Control system (GNC) takes decisions for planning & controlling the autonomous vehicle based on the information received from the perception system. The path planner subscribes to the traffic, lane and reference-route information to generate distance based path using path search algorithms. The motion planner generates velocity, position and heading profiles in accordance to the path and the vehicle control system provides corresponding control actions (accelerate, brake, steer) to the drive-by-wire system. Design & Development of an AUTOSAR compliant Gateway ECU on a Dual core controller for a Hybrid vehicle. Design and development of Driver Detection system for Tier1 supplier.